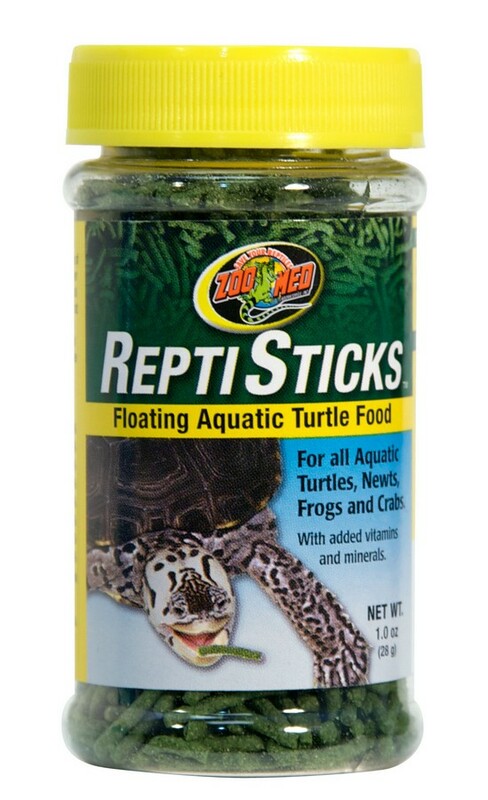 ReptiSticks™ Floating Aquatic Turtle Food | Zoo Med Laboratories, Inc. 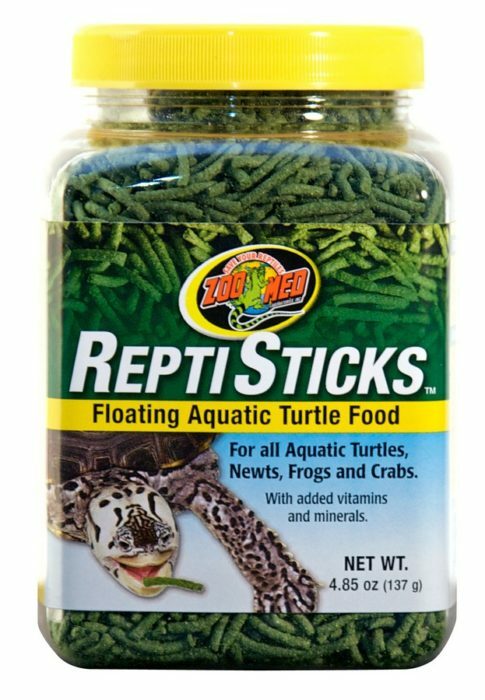 Zoo Med’s floating ReptiSticks™ are specially formulated to meet the needs of aquatic species of turtles, newts, frogs, and crabs. Zoo Med has over 25 years of experience researching the nutritional requirements of reptiles and developing foods that meet their needs. In nature, aquatic turtles eat animal and plant material as part of their natural diet. This food is made with fish, shrimp, and kale to simulate their natural diet. With added vitamins and minerals. Feed one to two times daily. 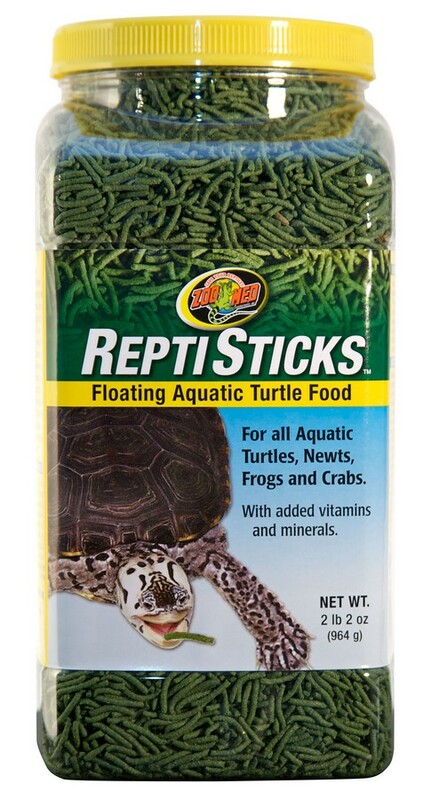 Place a small portion of floating ReptiSticks™ in the water and allow them to eat for up to 5 minutes. Remove any uneaten food with a net after one hour. For additional variety, offer your turtles Zoo Med’s Can O Shrimp and turtle treats. Fish Meal, Soybean Meal, Wheat Flour, Wheat Starch, Shrimp Meal, Corn Flour, Soy Protein Concentrate, Wheat Gluten, Kale, Fish Oil, Brewers Dried Yeast, Lecithin, Dicalcium Phosphate, Choline Chloride, L-Ascorbyl-2-Polyphosphate (source of stabilized vitamin C), Vitamin E Supplement, Niacin, d-Calcium Pantothenate, Riboflavin, Thiamine Mononitrate, Biotin, Pyridoxine Hydrochloride, Folic Acid, Vitamin A Supplement, Vitamin D3 Supplement, Vitamin B12 Supplement, Manganese Sulfate, Zinc Sulfate, Ferrous Sulfate, Copper Sulfate, Sodium Selenite, Potassium Iodate, Green 3, Propionic Acid (a natural preservative).